« You Might Be a Winter Vandweller If …. 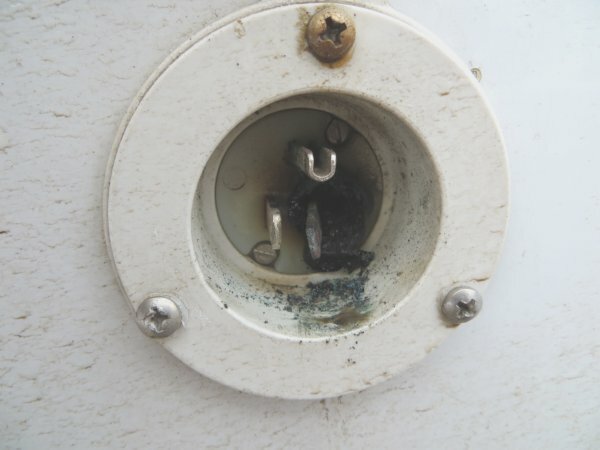 I recently had a close call with 120V electricity that could have started a fire or worse. It was what some call a “hot connection” – a point where the plug and inlet got hot and caused problems. Don’t let this happen to you! Disclaimer: The following are some thoughts I had regarding powering devices in a van (such as a battery charger, air conditioner, space heater, etc.) using an extension cord and shore power. Do not take this information as gospel. These thoughts are provided for your edification and entertainment only. First, here is the setup and then where I went wrong. The van had a Marinco 15 amp inlet mounted through a hole cut in the side of the van just behind the driver. I got lazy and not thinking, was using a green 16 gauge cord (like you use for Christmas lights) to connect to shore power sources. This worked fine for some time. The shore power demands were low. With the cold weather, I’d bumped the heater to the high setting and started pulling 12.5 amps. Just before the Decorah trip, I was checking some things over and discovered the damaged connector and cord. The two had still been engaged but were in pretty bad shape. The inlet was burned and crumbled apart when I touched it. Though none of the following thoughts is earth shattering, it doesn’t hurt to take a minute and think about what kind of shore power cord we need and if what we are using to connect is appropriate. After all, sometimes our needs change! Use a high quality extension cord… It doesn’t matter if you are a vandweller or what the application is for, a cheap cord is no bargain. This was one place where I went wrong. Was it worth nearly destroying the van and all that conversion work to save a few bucks by using a crappy $10 extension cord? Obviously, no! A 50 foot cord available for $10 costs less than the same length of bubble gum… Isn’t that a scary thought? You get what you pay for. A bigger wire gauge is usually better… Do you need 12.5 amps to run a space heater? Don’t use a 16 gauge cord which at best can supply 13 amps. I’ve been reading articles about how some of the cheap Chinese extension cords with molded plastic connectors have been melting and catching on fire when the 13 amp spec is barely exceeded. The cords meet the ratings but with nothing to spare. 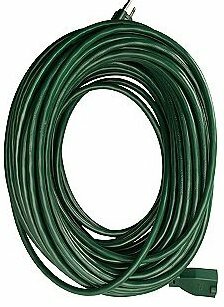 A 14 gauge or preferably 12 gauge cord is a better choice. Most 12 gauge extension leads (the term the Brits use!) can easily handle 20 amps but check the ratings anyway. Some are only rated for 15. New Marinco 20 amp outlet. Keep the connectors as clean as possible. This likely where I went wrong. When not in use, I should have kept the connector clean by plugging in a child safety cover, bagging it, or just putting the extension cord in the garage. I was lazy and let the shore power cord lay on the ground when it was not plugged in. Both Dad and I stepped on the plug and got dirt in the female end, not to mention all the moisture it was normally exposed to. 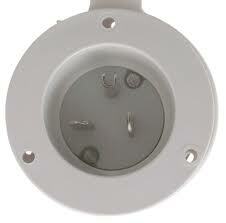 Then when the plug was inserted into the inlet, that dirt was shoved in deeper. This is a very dangerous situation… The contaminants can cause extra resistance, heat, and possibly arcing. Resistance causes heat which causes more resistance which causes more heat and more resistance… Things can get out of hand and performance will plummet… and might even cause a fire. Everything is fixed now. It only took a little time to beef up the inlet (changing 15 amps to 20 amps) and to wire the new connectors to the extension cord. I’m delighted that the heater is performing better and there is no more worry about fire. Please be careful. Don’t get careless like I did and risk losing your investment (and vandwelling). Be safe! Thanks Brad. I am careless and will just drop my electric cord while doing other things. I didn’t really think much about keeping it clean. I will link to this on my blog if you don’t mind. It’s the hot weather that will kill you faster. That is a great point. The problem could very well have started as corrosion from moisture. It’s kind of hard to say. Keeping the rubber cap on the inlet is a good idea as well as plugging the cord. I agree with you about the cold / hot thing in that the cord and connector will likely not get as hot in the cold temps. If it’s 100 degrees out it might not be a good idea to try and pull 16 amps. Generally people always overload a mickey mouse cord, if its just for 15+ minutes its not that big of a deal. If your cord is feeding a motor load, then you will get a greater then 3-5% voltage drop and that will drastically shorten the life of the motor. the longer the distance the higher the voltage drop will be. With a light bulb, toaster or heater its not that big of a problem as long as it is not a constant load. Great points… If you go with a longer distance cord, its resistance is higher, there is more voltage drop, and you have to go with a larger gauge of wire. If it weren’t for the A/C and the space heater, I could get by with a 16 gauge. I drive school bus, and I see burned up plugs on the buses all the time. snow, dirt, bent, etc…good thing you caught yours before you burned up! Thanks Mick. Amen! I’m going to watch it a lot closer… The right cord, clean connections, and keeping the moisture out will likely help a lot. The long durations of running a high current heater brought to light the deficiency.